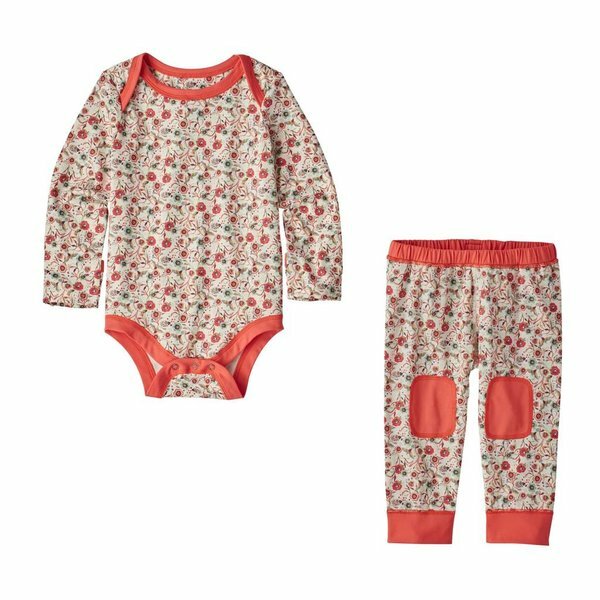 This Patagonia Capilene set will soon become your go-to base layer for your baby. This set is incredibly soft and sooo cute! Worn together or separately, the versatile Infant Capilene® Set baselayer comfortably protects little ones against harsh exposure and cold. It also packs tiny, dries fast, fights odor, goes on easy and is incredibly soft-wearing. Made of 88% recycled polyester/12% spandex sueded-jersey fabric, the two-piece baby baselayer has Polygiene® permanent odor control and a wicking finish for excellent moisture management. Sleeves have a self-fabric fold-over mitt to keep hands extra warm. The bottoms have an elasticized waist, knee patches and an expanded back gusset for extra diaper room and mobility. Fair Trade Certified™ sewn.